Lay the remaining concrete blocks in the bottom row by buttering one end of each block, and positioning it next to the adjoining block. 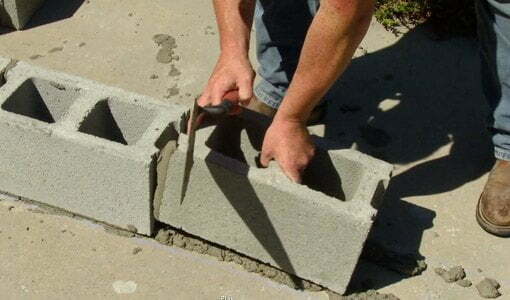 Press each block down into the mortar bed and against the previously laid block so all mortar joints are 3/8” wide. Adjust each block so it’s flush and level. Continue this process until the first course is complete. Want to build a house with 3 bedroom, joint sitting and dning room and kitchen. The size of the house is 9m by 13.5. How many blocks I need to get? I’m doing a concrete block fence and I need some info. It is going to be six foot height and 73 feet long.